Wise Wayz Water Care (WWWC) programme is based on the South Coast of Durban- in the communities of Folweni and Ezimbokodweni. It is there where the desire grew from two community groups at grassroot level – to restore and manage the communities’ dwindling natural resources and build a sustainable project for future generations to come. The programme stemmed from humble efforts by the local citizens to empower themselves in order to mitigate the social, economic and environmental challenges that confronted them. As South Africa is a water stressed country and has been experiencing droughts and low water levels, this stimulated the community to protect the aquatic ecosystems, such as the wetlands,rivers and streams of Ezimbokodweni and Folweni. It was community members like Desmond Malgas, who is now a project coordinator, who went knocking for assistance and support from corporates and organisations, to endorse their project and indeed, the AECI Community Education and Development Trust jumped onboard. This is how the WWWC programme was born. Since its inception in 2016, the programme has been able to bring hope to the lives of the downtrodden communities of Folweni and Ezimbokodweni and has allowed them to think beyond their circumstances. Mr Malgas, alludes to how the project has personally helped him to develop and improve himself in terms of learning about governance, and the skills that he has acquired through the training he has received. He further extols that it has also allowed him “to grow, find full expression through uplifting his community and changing his mindset to see a better future”. Its three-tier model encompasses the different levels of donor, implementer and beneficiary. This project, funded by the AECI Community Education and Development Trust and implemented by i4WATER – has been able to build synergy between corporates and the community, by introducing interventions that develop sustainable livelihoods through impactful and practical measures. Some of the interventions include water conservation, food security, solid waste management, alien plant management, aquatic assessment and monitoring as well as Sinqonqozela Ulwazi (which aims to educate the community and create awareness around waste management). 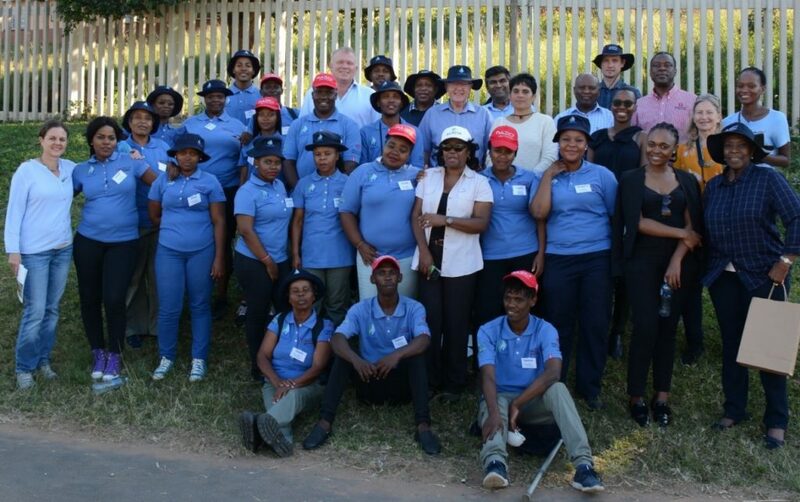 The Wise Wayz Water Care team with members of the AECI Community Education and Development Trust and Brand SA representatives at the interactive site visit. The programme has had a huge impact on the members who have also become beneficiaries of the project in several ways. It has been able to give the youth and elderly members a stepping stone to realising their future prospects through providing skills and knowledge on a basic, intermediate and advanced level. It has also trained and supported the commercial agriculture start-up of the project’s food security intervention by supporting community gardens. The food garden component has yielded a supply of vegetables for consumption by the community. The project recently won its first contract to get profits from their Invasive Alien Plant clearing start-up. Although they have faced several challenges, it is their vision to upscale the piloted model and continue successful sustainable change throughout the country. This keeps an implementer such as Ntswaki Ditlhale of i4WATER committed to the values and vision of the project.